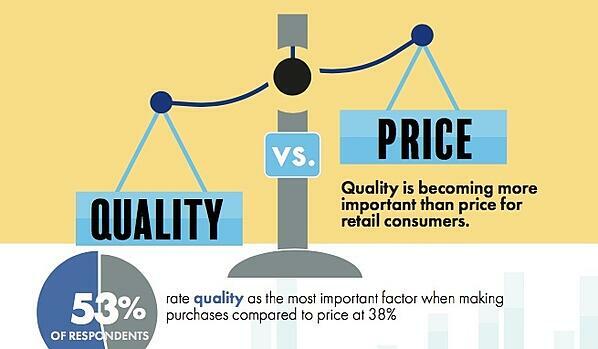 June 25, 2018 – Quality is becoming more important than price to most consumers, as 53 percent rate quality as the most important factor when making purchases compared to price (38 percent) according to a new report by First Insight, a technology company transforming how leading retailers make product investment and pricing decisions. The report also notes that consumer expectations for discounts are falling as an increasing proportion of consumers surveyed said department store discounts had no influence on expectations for discounts across other categories including vehicles, smartphones, furniture, home appliances and home electronics. The survey queried 1000 participants in the U.S. on their shopping habits, purchase behavior and influences driving decisions, and tracked changes in consumer sentiment on the impact of widespread discounting by department stores and mass merchants from March 2017 to December 2017. According to the results, furniture and vehicle categories reflected the sharpest percentage change in expectations with the number of people saying discounts had no impact on purchases rising 98 percent and 74 percent respectively. Home appliances (36 percent), home electronics (27 percent) and smartphones (26 percent) also saw significant increases in people who said that discounts had no impact on their purchase decisions in these categories. The percentage of men and Baby Boomers who said discounts do not influence their purchase decisions more than doubled (111 percent and 128 percent increases, respectively) in the furniture category, with the percentage of Millennials nearly doubling (94 percent increase). The percentage among women and Generation X respondents also increased around 77 percent each. The percentage of women and Millennials who said discounts do not impact their purchase decisions on vehicles nearly doubled (97 and 93 percent respectively) from March to December 2017. While the percentage of men also increased by 52 percent, it was by a much slimmer margin, as were Generation X (60 percent increase) and Baby Boomers (78 percent increase). While a growing percentage of men (61 percent more) and Baby Boomers (64 percent more) show lowering influence of discounts on smartphone purchases, the impact of discounts on women’s and younger generations’ purchases is about the same or increasing. Women saw a nine percent decrease in the percentage of respondents who said department store discounts have “no influence” on expectations for smartphone purchases, with Generation X decreasing by five percent in December, compared to March of last year. While the percentage of respondents that said department store discounts were having “no influence” on expectations for discounts in home appliances increased overall, particularly with Baby Boomers (87 percent increase), the percentage of Millennials increased by only three percent. Male respondents increased nearly 50 percent, with women respondents increasing 20 percent and Generation X increasing 30 percent. The percentage of Baby Boomers reporting that discounts influenced their home electronics purchases dropped nearly 60 percent, significantly higher than Generation X (14 percent) and Millennials (18 percent). Men are also less likely to be influenced by discounts in home electronics than women, with a 34 percent increase in respondents in December compared to March saying department store discounts had “no influence” on expectations in this category, compared to an only 18 percent increase in women. Fifty-four percent of men and 51 percent of women ranked quality as the most important factor when making a purchase. Similarly, more than half of Baby Boomers, Millennials and Generation Xers choose quality over price, with Xers the most influenced by price (41 percent) versus Millennials and Baby Boomers, with 36 percent of both groups saying price was the most important factor. Similarly, while 62 percent of affluent respondents (who make more than $100,000 per year) ranked quality as the most important, compared to 49 percent of those that made less, it was still significantly more important than price with both groups. Twenty-eight percent of affluent respondents ranked price as most important, versus 43 percent of those who made less.